The Poll feature allows you to gather quick responses to a single question. Surveys and polls are both methods for gathering feedback from participants, although polls are commonly known for being shorter and more focused. Polls are often seen embedded in websites, blogs, or social media timelines for swift response on an ongoing topic. From the Tool dropdown in the top right corner of the screen, choose Poll Tool. Poll Title: Assign a unique name to each poll to differentiate it from other polls. Primary Language: This is the language in which your poll will be created. Primary language cannot be changed after poll creation. Secondary Languages: Create a poll in multiple languages other than the primary language selected. Click on Start Poll to build your first poll. Question: Select a question type from the dropdown menu on the left-hand side of the screen. Then, enter your Question and Answer texts in the respective sections and click on Continue. Radio Button: Useful when the participant is supposed to select only one answer option and has eight or fewer answer options to choose from. Drop Down: Useful when the participant is suppose to select only one answer option and has more than eight answer options to choose from. Multiple Select Check Box: Useful when the participant is supposed to select multiple answer options from a list. You can include the ‘Other (please specify)’ option, to allow participants to provide candid feedback beyond the options provided. Translate: You may translate the poll into multiple languages. This is possible only if you select secondary languages while creating the poll.You can click on the ‘Auto Translate with Bing’ icon to let the system make translations on your behalf, or you can manually enter translations for each languages. Click on Continue to save translations. Auto-translation feature is available for the following languages: Arabic, Chinese (Simplified), Chinese (Traditional), Deutsch, Dutch, English (UK), Español, Finnish, Francais, Greek, Haitian Creole, Hebrew, Hindi, Italian, Japanese, Korean, Norwegian, Polish, Portuguese (Brazil), Portuguese (Portugal), Russian, Slovenia, Swedish, Thai, Turkish, and Vietnamese. Expiry Date and Time: Set an Expiry date and time for your poll or, by default, the poll will not expire until your account expires. Share your Poll: Enabling this feature allows participants to share it on any website, or blog, or social media, or even among their friends/colleagues. Block by Cookie: Participants will be able to submit their responses once. A second response will not be accepted unless they clear the browser cache/cookies. Block by IP address: Participants will be able to submit their responses only once through a computer/laptop. A second response will not be accepted unless they an attempt to respond to the poll through a different computer/laptop. Visual Design: Set colors, add a Poll logo, and select font settings for the Poll. This customization can be done through a wide variety of options provided by the system. Template: You can select a theme for your poll from the different templates provided in your account. You can also create a customized theme yourself and save. Poll Size: Set the size of the Poll window as it should be displayed on the participant’s screen. There are three options that you can select from: small, medium, and large. 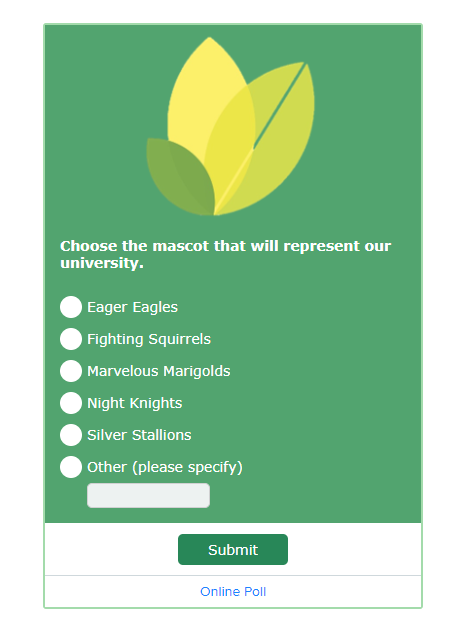 Color: Consists of options to set the question color, answer color, and background colors of the Poll participation page. Font: Font Settings represent the font type and size of the textual component of the Poll. Here, the user can select the font type and size for display throughout the Poll. The system provides 13 different font types to choose from. Show Logo: The logo is an image that will be displayed at the top of the Poll participation page. You can either upload an image to be displayed as the logo for your Poll or choose to display the account logo (this option is available only if an account logo is added in the ‘Company Information’ section, under the ‘Settings’ section). The logo can be uploaded in two ways: browse and add an image file or copy and paste the URL of an image found online. Acceptable file formats for images are .jpg, .png, and .gif. The maximum logo file size is 5 MB. Preview Sample: View the layout of the poll. The preview is an exact replica of the live poll. Result Settings: Choose whether or not to display the poll’s results to participants after submission of their responses. You can also select various chart types and color schemes for these results. Chart Type: Poll results are displayed in the form of charts. You can choose the type of chart to be displayed from a variety of options, such as Vertical Bar Graph, Horizontal Bar Graph, Pie Chart, Area Chart, Bubble Chart, Cylinder Chart, Range Chart, Radar Chart, and Donut Chart. Beside the type, you can also choose to display the chart in 2D and 3D formats. Color Schemes: This section enables you to select a color scheme for the chart. Choose from options including Autumn, Bright, Lavender, Mid Tones, Mixed, Pastel, Poppies, Random, Spring, Warm Earth and Water Meadow. Publish Your Poll: Displays options to publish Polls. Depending on how you would like to share this poll, you can generate either a link or an embed code. Quick Participation link: Generates a participation link for the poll. This link can be posted anywhere or shared among the participants. For multilingual Polls, a new link will be generated for each language with Primary language at the top followed by secondary languages. Poll Embed Code: Generates an HTML code for the poll which can be added to websites or blogs to collect responses. 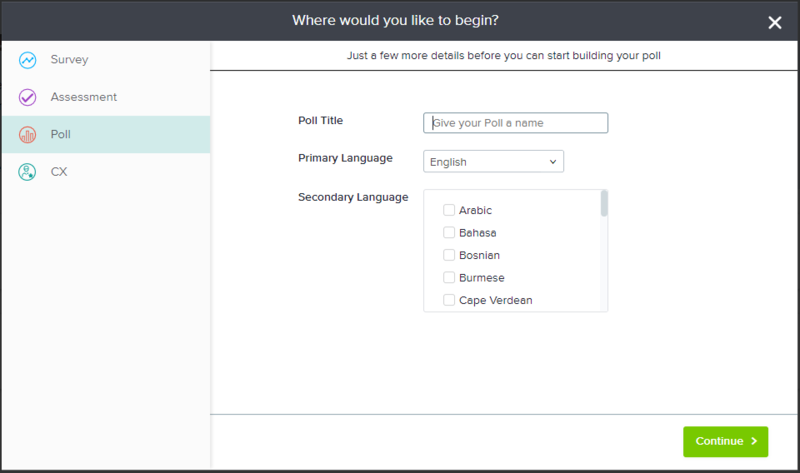 For multilingual Polls, a dropdown will be provided for languages in which the primary language will be selected by default and its code will be shown. Changing the dropdown options will show the code for each corresponding language. Click on Finish to publish and make the Poll live.